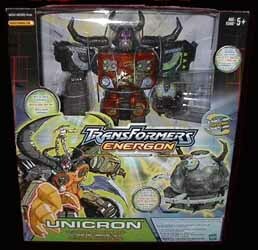 The Unicron pack is a monster of a toy. 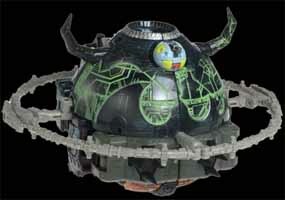 Unicron transforms into a planet which is capable of holding 27 Mini-Con figures (and a Dead End Mini-Con figure is included). His fist and eyes light up and this is one of the best transforming robots, as it actually changes into something that doesn't just look like a vehicle that has been bent a bit (like most of the The Powerlinx Combiners range). 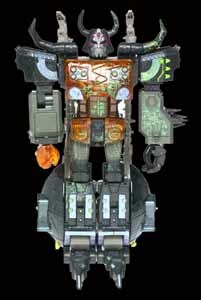 As a planet, Unicron is totally unrecognisable as his robotic self. As fans of this range have come to expect, it's relatively simple to transform this figure from planet to robot and back again - but, unlike other toys in this range - the planet acts more as a play set for Mini-Con action figures. You might think that £50 is a little bit expensive, but you get a lot of toy for your money. One of the best Transformers toys to be released.